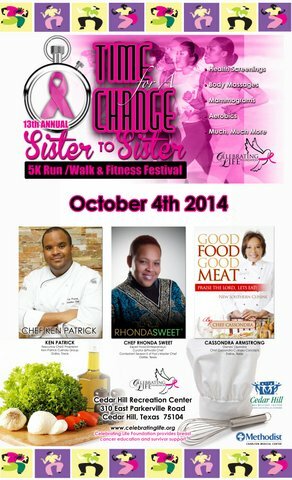 The Chefs Are Spicing It Up for the 13th Sister to Sister Fitness Festival, taking place at the Cedar Hill Recreation Center on Saturday October 4th, 2014. DALLAS - Sept. 10, 2014 - PRLog -- “Food plays a vital role in our health. Like the old adage goes you are what you eat. Therefore we have to watch what we put in our bodies and take a more fresh approach to food and life,” states Chef Ken Patrick, who is one of the featured Chefs for the 13th Sister to Sister Fitness Festival, sponsored by the Celebrating Life Foundation. The Sister to Sister (5K) Fitness Festival will take place on Saturday, October, 4, 2014, at the Cedar Hill Recreation Center, 310 Parker Rd, in Cedar Hill, Texas. This event raises funds and promotes awareness in the battle against breast cancer among women of color. “This year’s event is all about helping people embrace a healthy lifestyle. It is time to change things to make the rest of your life, the best of your life, “states Sylvia Dunnavant, the Founder of the Celebrating Life Foundation. Executive Chef Ken is known for his New American Cuisine. His big, bold flavors are inspired by great ingredients. He has developed a unique & uncomplicated cooking style by elevating simple, fresh ingredients to some of the most delicious food ever tasted. He and his three year old son will be doing a food demonstration to delight the taste buds of this year’s attendees. Chen Ken, Chef Rhonda Sweet, and Chef Cassondra Armstrong will be adding flavor to this year’s event as he is joined by other chefs and local cooks, who will be sharing healthy food options for this year’s participants. The festivities will begin with an aerobic workout at 8:00 AM. The race/walk will start at 8:30 am. Other activities include health information, mammograms, a blood drive, singers, dancers, and a drum performance. The Celebrating Life Foundation is a non- profit organization devoted to educating the African American community and women of color about the risks of breast cancer, and the benefits of early detection and treatment. For more information about media coverage, sponsor and vendor opportunities contact Public Relations Director Stephania Schirru via email info4celebratinglifefoundation@gmail.com or phone 405-208-0011. This program is being sponsored by Charleston Methodist Health Systems, and the Cedar Hill Recreation Center.